I had heard through the grapevine about this woman, but today I received a link for the video about her by the Texas Country Reporter. I love a good play on words. Can’t resist you know. I haven’t yet got the store on a Facebook account, let alone a Twitter account. Some of you – and my conscience – tell me, “You’ve got to do this Linda!”. But in my defense, I’ve got to tell you, I’ve been busy getting the website re-vamped. Styling. With it. Or I hope you think so. Check it out at www.alongcamequilting.com . That, and doing my bit with this blog these last few months have been the main focus of my CCO responsibilities. And since I’ve still got a bit of behind-the-scenes work with the website going on, I won’t be setting up a Facebook or Twitter account for a little while yet. 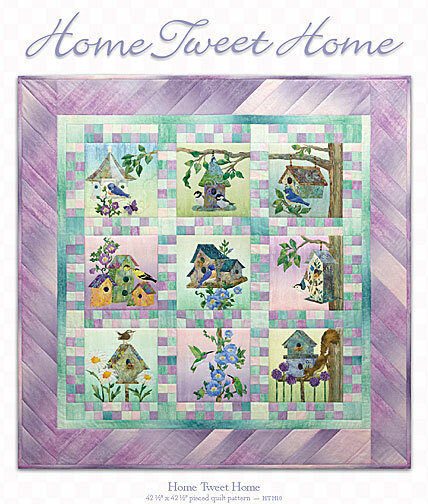 Home Tweet Home consists of nine appliqued bird houses, feeders, or flowers, with – other than the renegade squirrel – birds. Pretty little birds, such as the hummingbird and goldfinch. 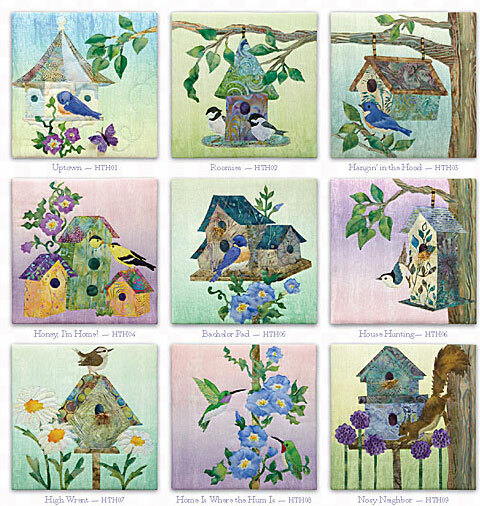 Add in some flowers on graduated backgrounds, and you have nine sweet little vignettes of the birds’ summer days at home. McKenna designed a checkerboard sashing and bias border to tie them all together into a 42 1/2″ square quilt wall hanging . I loved it and have ordered the patterns, embellishment kits, fabric, and shop cutting guide. The backgrounds will be arriving shortly, as should the guide and shop patterns. Once we have these, we can begin the process of reviewing the suggested cuts, and pricing the program out. The batiks used are not yet at the distributors, but they’ll be shipped as soon as they arrive. Right now, we are taking names of “Bird Watchers”. These people will be contacted as soon as we begin registration, and a couple of days before I e-mail the general populace. This way the bird watchers get first sighting, and a spot in the program. If you would like to become a “Bird Watcher”, please e-mail us at askus@alongcamequilting.com or phone us toll-free at 1-877-745-6445 or locally at 403-253-4419, and ask to be added to the bird-watcher’s list.